Retractable plastic and metal ball pen with double injected soft rubber inserts in the grip zone and shiny Chrome accents. It has a Blue ink TRENDS Large Volume refill with 1800 metres of German manufactured DOKUMENTAL ink and a tungsten carbide ball for improved writing quality. Black ink is available for an additional charge. Colours: White, Yellow, Orange, Red, Bright Green, Dark Green, Light Blue, Dark Blue, Black. Dimension: Dia 13.5mm x L 138.5mm x 17mm (includes clip). Print Description: Positions D & E - 45mm x 9mm. Print Type: Pad Print. Packing: Loose packed or an optional presentation box or sleeve. 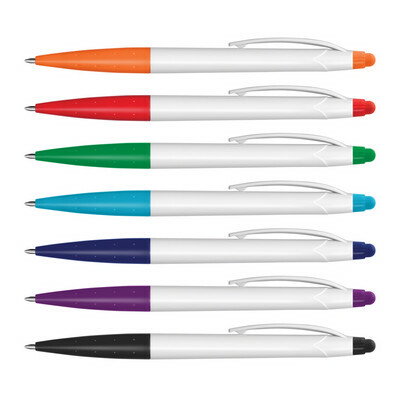 Retractable plastic ball pen with a Clear barrel, a translucent soft rubber grip, translucent trim and a unique spring loaded, pull out flag which can be branded in full colour on both sides. It has a TRENDS Blue or Black ink refill with 1200 metres of German manufactured DOKUMENTAL ink and a tungsten carbide ball for improved writing quality. Flag is only available on indent for a minimum of 1000pcs. Colours: Yellow, Orange, Red, Bright Green, Blue, Purple, Black. Dimension: Dia 13mm x L 146mm x 16.5mm (includes clip). Print Description: Positions E & K - 50mm x 7mm. Print Type: Screen Print. Packing: Loose packed or an optional presentation box or sleeve. Less than minimum quantities are not available for this item. MOQ applies per colour on this item. Retractable brass barrel ball pen with a lacquered barrel, a soft rubber grip and shiny Chrome accents which can be mixed and matched in 1452 colour combinations. It has a Blue or Black ink TRENDS Large Volume refill with 1800 metres of German manufactured ink and a tungsten carbide ball for improved writing quality. Turbo laser engraves to a brass colour. Colours: Mix and Match - Metallic Silver (barrel only), White, Yellow, Orange, Pink, Red, Bright Green, Dark Green, Light Blue, Dark Blue, Purple, Black. Dimension: Dia 13.5mm x L 137.5mm x 17mm (includes clip). Print Description: Positions D & E - 45mm x 9mm. Print Type: Pad Print. Packing: Loose packed or an optional presentation box or sleeve. 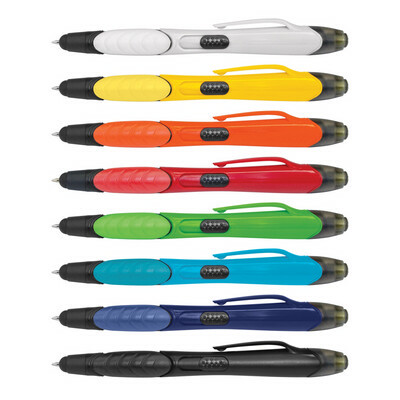 Retractable plastic and metal ball pen with a soft rubber grip and built in highlighter. The highlighter colour matches the pen colour with the exception of the White and Black pens which both have a Yellow highlighter. It has a TRENDS Black ink refill with 500 metres of German manufactured DOKUMENTAL ink and a tungsten carbide ball for improved writing quality. Colours: White, Yellow Orange, Pink, Green, Blue, Black. Dimension: Dia 12mm x L 151.5mm x 20.5mm (includes clip). Print Description: Positions D & E - 35mm x 9mm or 40mm x 7mm. Print Type: Pad Print. Packing: Loose packed or an optional presentation box or sleeve. 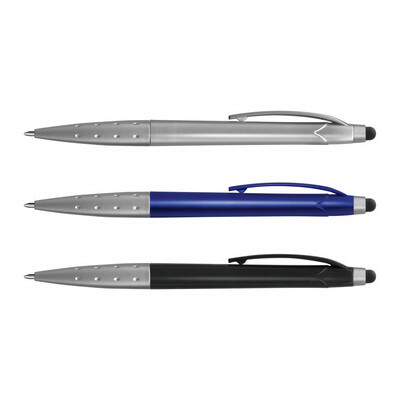 Retractable plastic and metal ball pen with a highly polished UV lacquered barrel and shiny Chrome accents. It has a TRENDS Black ink refill with 1200 metres of German manufactured DOKUMENTAL ink and a tungsten carbide ball for improved writing quality. Colours: Silver, Blue, Black. Dimension: Dia 10mm x L 145mm x 16mm (includes clip). Print Description: Positions D & E - 45mm x 7mm. Print Type: Pad Print. Packing: Loose packed or an optional presentation box or sleeve. Large novelty 'pencil style' retractable ball pen with Black ink and a cardboard barrel. A lead time of 10-15 working days applies to this product. Colours: Orange, Red, Lime, Blue, Black. Dimension: L 162mm. Print Description: 44.5mm x 8mm (one colour). Print Type: Pad Print. Packing: Loose packed. Less than minimum quantities are not available for this item. MOQ applies per colour on this item. Multi colour retractable plastic ball pen with a soft rubber grip which has Black, Blue and Red ink refills. A lead time of 10-15 working days applies to this product. Colours: White/Blue, White/Black. Dimension: L 146mm. Print Description: 32mm x 12.5mm (one colour). Print Type: Screen Print. Packing: Loose packed. Less than minimum quantities are not available for this item. MOQ applies per colour on this item. Multifunction retractable plastic ball pen with Red, Green, Blue and Black ink refills. Has a soft rubber grip and a features a fully functional massage roller. A lead time of 10-15 working days applies to this product. Colours: White/Blue, White/Black. Dimension: L 178mm. Print Description: 22mm x 6.5mm (two colour max). Print Type: Pad Print. Packing: Loose packed. Less than minimum quantities are not available for this item. MOQ applies per colour on this item. 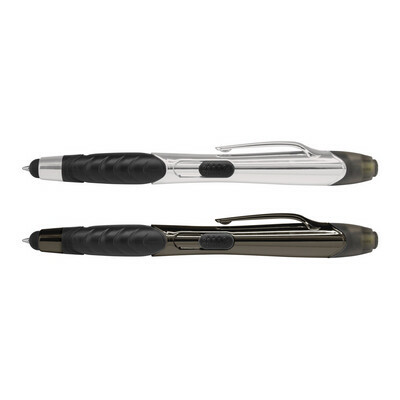 Multifunction twist action plastic and metal ball pen with a Black ink refill. Has a soft rubber grip, a stylus for use with touch screens and features a removeable top part which houses a screwdriver set with both a Phillips and a conventional screwdriver. A lead time of 10 - 15 working days applies to this product. Colours: Silver, Blue, Black. Dimension: L 152mm. Print Description: 51mm x 9.5mm (one colour). Print Type: Screen Print. Packing: Loose packed. Less than minimum quantities are not available for this item. MOQ applies per colour on this item. Retractable plastic ball pen with a Black barrel, a soft rubber grip, a stylus for use with touch screens and a highlighter. The highlighter colour matches the cap colour except for the Red cap which has a Pink highlighter. It has a Black ink refill with 400 metres of ink and a tungsten carbide ball for improved writing quality. Colours: Yellow, Orange, Red, Green, Light Blue, Purple. Dimension: Dia 13mm x L 138mm x 18mm (includes clip). Print Description: Position D: 30mm x 8mm. Print Type: Pad Print. Packing: Loose packed or an optional presentation box or sleeve. Retractable plastic ball pen with a soft rubber grip, a stylus for use with touch screens and a Yellow highlighter. It has a Black ink refill with 400 metres of ink and a tungsten carbide ball for improved writing quality. Colours: White, Yellow, Orange, Red, Green, Light Blue, Dark Blue, Black. Dimension: Dia 13mm x L 138mm x 18mm (includes clip). Print Description: Position D: 30mm x 8mm. Print Type: Pad Print. Packing: Loose packed or an optional presentation box or sleeve. Retractable plastic and metal ball pen with a highly polished UV lacquered barrel, a soft rubber grip, a stylus for use with touch screens and a Yellow highlighter. It has a Black ink refill with 400 metres of writing ink and a tungsten carbide ball for improved writing quality. Colours: Silver, Gunmetal. Dimension: Dia 13mm x L 138mm x 18mm (includes clip). Print Description: Position D: 30mm x 8mm. Print Type: Pad Print. Packing: Loose packed or an optional presentation box or sleeve. Twist action plastic ball pen which has a stylus for use with touch screens. It has a Black ink refill with 500 metres of writing ink and a tungsten carbide ball for improved writing quality. Colours: White, Black. Dimension: Dia 11mm x L 139mm x 14mm (includes clip). Print Description: Positions D & E - 50mm x 7mm. Print Type: Pad Print. Packing: Loose packed or an optional presentation box or sleeve. Twist action plastic ball pen which features a metallic barrel, metallic Silver trim and a stylus for use with touch screens. It has a Black ink refill with 500 metres of writing ink and a tungsten carbide ball for improved writing quality. Colours: Silver, Blue, Black. Dimension: Dia 11mm x L 139mm x 14mm (includes clip). Print Description: Positions D & E - 50mm x 7mm. Print Type: Pad Print. Packing: Loose packed or an optional presentation box or sleeve. 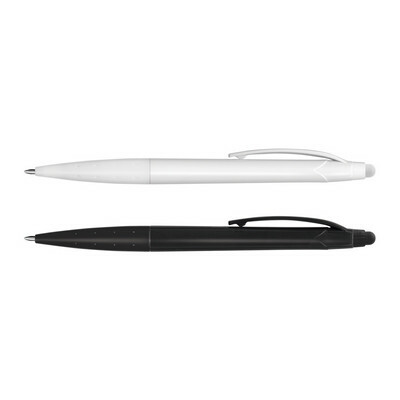 Twist action plastic ball pen with a white barrel and a stylus for use with touch screens. It has a Black ink refill with 500 metres of writing ink and a tungsten carbide ball for improved writing quality. Colours: Orange, Red, Green, Light Blue, Dark Blue, Purple, Black. Dimension: Dia 11mm x L 139mm x 14mm (includes clip). Print Description: Positions D & E - 50mm x 7mm. Print Type: Pad Print. Packing: Loose packed or an optional presentation box or sleeve.